Metal has a strange trend going on right now in regards to album titles. It has become baffling normal for a metal, especially one from overseas to use this Latin-themed character as the first letter of an album title: Æ.
I'm not sure why this is. Maybe it makes the album title seem more metal. I find it weird and difficult to type in using a normal keyboard without finding the character online, copying, and pasting. 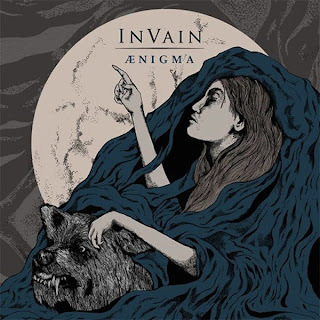 In Vain is a lesser known metal band from Norway, whose music is really well-constructed. In terms of metallic style, one could realistically categorize In Vain's music as progressive metal, black metal, or even melodeath. I would call it a creative amalgam of all three styles. This album contains sections of full-on thrashing shred, progressive guitar leads, and blackened viciousness. Make no mistake that this album is extreme metal. "Ænigma" shows the band taking their sound to a whole new level and improving on both technicality and production. This is a heavy disc, but it still sounds very progressive. Production values are very crisp, which allows the guitar leads and acoustic sections to shine. Vocals are even more chaotic than they were on the band's previous album, "Mantra." However, there is a fair amount of clean singing on this album, which I find to be welcome. In Vain used this vocal style on "Mantra," but more sparingly. "Mantra" was a masterful record and incredibly well-written. By contrast, "Ænigma" sounds more mature and more polished. While few of the songs are instantly memorable, the album as a whole carries and unmistakable vibe. After a couple of listens, I can attest that this album is every bit as good as "Mantra" was. If you have not heard any of this band's previous work, you definitely should check it out. I have attached the whole album stream via YouTube below for your listening pleasure. As always, thanks for listening and enjoy!